I christen this dish French Chicken as I saw it on a French food blog A Foodie Froggy in Paris and it is full of French flavours. The other qualifier is that it is needessly complicated in places as all great French food should be! I tweaked the recipe here and there subsituting ingredients for things I had and were cheap rather than the more expensive options of porcini and fois gras. I would not recommend that you try wrapping the chicken in spiraled strips of pastry as I did. I will give a different idea in the recipe that should give you a pretty sort of plaited effect and be a hell of a lot easier. While I was wrapping these up I swore like a trooper, they were HARD! But if Gordon Ramsey is anything to judge by may be the swearing makes food taste better because these were delicious! 1 quantity Rough Puff Pastry, or buy ready made. – Put the mushrooms and onion in a large pan and fry until just soft. – Add the garlic and parsley and stir well. – Transfer to a food processor and pulse until coarsely chopped. – Heat the oven to gas mark 6 and have a large ovenproof dish ready, you may need 2 as the chicken breasts cannot touch. – Split the chicken breasts on the top down the centre to create ‘boats’. First cut a line straight down then widen the pouch by cutting out to the sides, like an inverted T.
– Roll out the pastry and cut out 4 squares just larger than twice the size of the chicken breasts. – Place the chicken in the centre of the square. – Put a large spoonful of pate in the chicken ‘boat’ and smooth down. – Top this with the mushroom pate to make a small mound. – Cut strips in the pastry either side of the chicken then start at one end and fold the two strips on opposite sides over towards the other end of the chicken in a V shape. 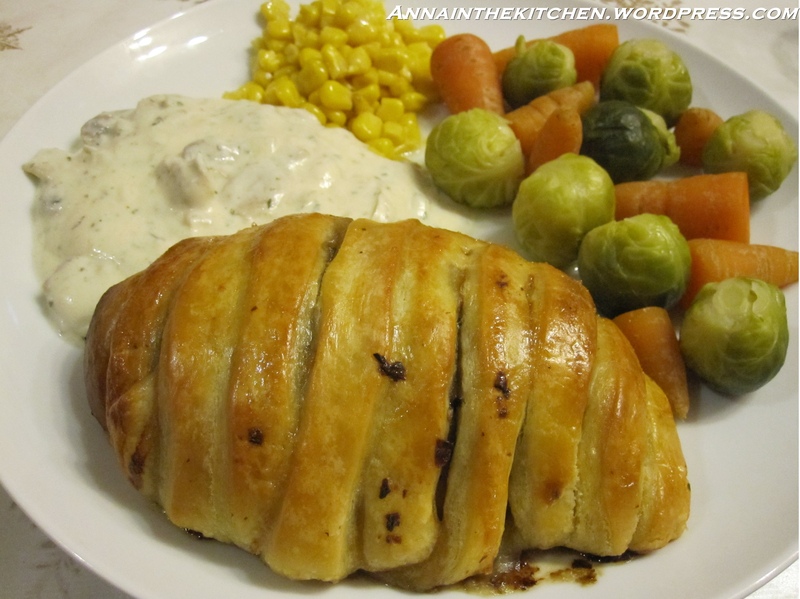 – Repeat this all along the chicken breast to create a plait effect making sure the whole thing is covered. – Brush with egg, place in the dish and cook for 30 minutes. If not quite browning turn up to gas 7 for the last 10 minutes. – Serve with whatever vegetables you like. A simple mushroom cream sauce makes a nice addition but its moist enough to eat without if you wish.